There's a lot to learn about mustard, which has long been associated with Dijon. Dijon mustard refers to a process for making mustard, not to where it's made. Most "Dijon Mustard" sold in the world today is NOT made in Dijon or even in Burgundy. The type of mustard referred to as "Dijon Mustard" should be strong (fort) and spicy, rather than sweet or mild. Traditionally mustard seed was grown in Burgundy, by the same people who made charcoal. Over the years, as charcoal production declined, so did mustard production. Seeds were imported from various other countries, with Canada the largest supplier. M Grey's mustard, before Grey Poupon. 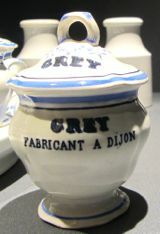 If you visit the Musée de la Vie Bourguignonne in Dijon, you'll see several displays of mustard pots and other items related to mustard. You can see Grey Mustard before M. Grey and M. Poupon merged their efforts to create Grey Poupon, the best known mustard in the US...owned today by Kraft Foods. Some traditional producers like Maille (founded in 1747) remain, but most mustard production takes place outside of France at industrial scale. One exception is the Moutarderie Fallot, based in Beaune, which uses traditional methods (stone grinding, low temperatures to preserve the flavor) to produce its mustards. It has also started supporting the growth of mustard seeds in Burgundy. 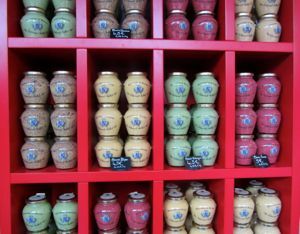 In Dijon, Beaune, and other parts of Burgundy you can buy a variety of flavored mustards—tarragon, cassis, nut, even pain d'épices (gingerbread spice). Being a traditionalist, I'll stick with the plain Moutarde de Dijon/Moutarde de Bourgogne or the seedy Moutarde en Grains. By the way, Dijon mustard makes a great salad dressing, and it's what you'll often be served in France. Mix about a teaspoon of Dijon Mustard with a tablespoon of vinegar, some salt, and pepper. When it's blended, add about 2 tablespoons of olive oil and shake or stir well. Adjust the flavor with more oil or vinegar, depending on your taste. Bon appétit! Above, An assortment of flavored mustards, at Moutarderie Edmond Fallot, Beaune. 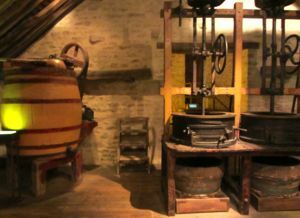 Below, Old fashioned equipment used in the production of Dijon Mustard.